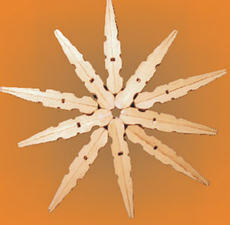 Making a Christmas star out of clothes pegs is both quick to make and looks good. You can hang the star up or you can even use it as a coaster for the table. Take the clothes pegs apart and glue the flat surfaces together. 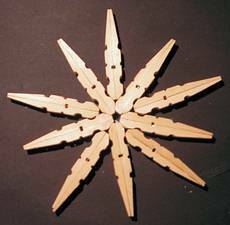 To make the star shape somewhat symmetrical or even, begin by gluing just 3 clothes pegs together (at an angle of 120 degrees) and then fill the spaces in between, or alternatively glue 5 clothes pegs together at an angle of 72 degrees. Even with this many pegs the spaces between are filled with more pegs. Finally, a string or rope is attached to the star and it is ready to hang up.